Do you think that we Hollanders who threw the sea out of our country will let the Germans have it? Better the sea. Noel Coward went on to employ most of the crew from this Michael Powell and Emeric Pressburger film, following a set visit that mightily impressed him (including editor David Lean and cinematographer Ronald Neame). He’d have been better to just ask Powell to direct In Which We Serve, which is both stagey and mannered; it hasn’t aged nearly as well as Aircraft, the first production from P&P’s The Archers production company. The Archers was formed as a result of a bet between Powell and cinema mogul Arthur Rank, who informed the director that the idea was defeatist and wouldn’t sell tickets. Powell believed it would be big success and he and Pressburger went ahead and made it under the banner of The Archers. Of course, Powell proved to be right. And, to his credit, Rank was forthcoming in admitting his error. As with Coward’s film, Aircraft was made in consort with the Ministry of Information - the British Government’s wartime propaganda department. While it is unabashedly patriotic, Powell is far too sensitive and intelligent a filmmaker to resort wanton jingoism or nationalistic fervour. 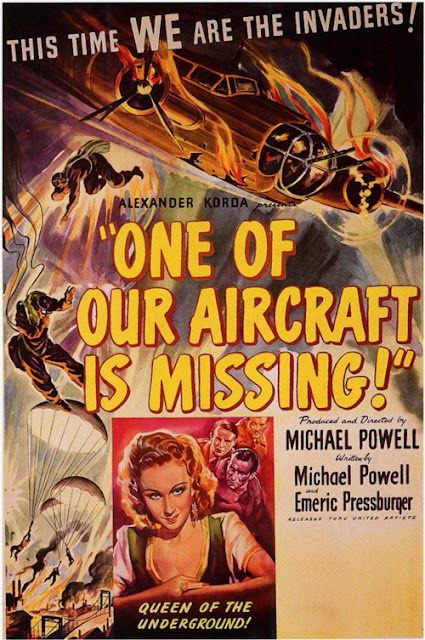 As with the previous year’s 49th Parallel (which won Pressburger an Oscar for its screenplay; Aircraft had to make do with a nomination), Powell follows a downed crew behind enemy lines. But whereas his earlier effort placed German submariners in Canada (a bid to encourage America to join the war), here a British aircrew bails out of their stricken bomber (B for Bertie) over the Netherlands. There’s a straightforward, matter-of-fact approach to the subject matter, rendering it distinct from earlier P&P collaborations. Powell’s aim was for “complete naturalism”, so there is no music score. They would not utilise a documentary style, rather a “detached narrative, told from the inside, of what it is like to be a pawn in the game of war”. The director employs devices such as the bomber crew introducing themselves directly to camera, conscious that this would be the first time most of the audience would encounter the interior of a Wellington. Which isn’t to say the result is not as dramatically compelling as any of their previous fictional films. But they are not aiming to replicate the heightened atmosphere of, say, The Spy in Black. While Neame’s black and white photography is often stunning to look at, Powell is intent on suggesting a realistic tone. He treats the story as an actual event, introducing the film with title cards informing the viewer of reprisals taken by the German army against Dutch civilians who helped British airmen escape back to England. The action of the crew moving from place to place is punctuated by the sight of German documentation granting permission to the Dutch to engage in every day activities. Powell thought that the opening, with the bomber hitting power lines and exploding, would be an instant audience-grabber. What sticks out about it now is that it’s one of the few moments where you are conscious of the limitations of the model work; in contrast, the extended sequence of B for Bertie bombing Stuttgart remains impressive 70 years later. It would be a mistake to see the film simply as a tale of plucky Brits engaging in derring-do to escape the fascist aggressors. Aside from some fisticuffs towards the climax, the British are a largely passive presence; it is the bravery of the Dutch underground that is continually in focus. And their representatives are chiefly women (played by Pamela Brown and Googie Withers, both delivering winning performances). The crew are played by Godfrey Tearle, Eric Portman (who was one of the German U-boat crew in 49th Parallel ), Hugh Williams, Bernard Miles (whom Coward would nab for In Which We Serve), Hugh Burden (playing the pilot and Dutch speaker), and Emrys Jones, spend a fair bit of time debating who should be the leader on the ground. But when it comes down to it Tearle’s WWI veteran volunteers that Withers is their leader. Tearle’s character of Sir George Corbett was inspired by Sir Arnold Wilson, an MP who joined the Royal Air Force at the age of 51; he was killed in action in 1940. It was Powell’s intention that the story should see the crew unite under the pressure of their situation (in contrast to the crew in 49th Parallel), ultimately risking all to save the old codger who had initially been dismissed as a pain in the neck. I’m not sure how strongly this theme comes across; it is certainly much less distinct than the message concerning the efforts of the occupied Dutch. Of course, there are a number of speeches during the proceedings that announce the mettle of those who would resist the occupying forces and underline the importance of allied co-operation (the Dutch do not have much to eat, but still, “We can think, hope, fight”). This is, quite intentionally, a mutual appreciation society. But Powell is not interested in presenting the Germans as inhuman, although for most of the film they are purposefully present only on the outskirts of the narrative. He makes a point of having Miles reminisce about a German girlfriend during the flight out. Later, Googie shows she is not without empathy, despite being as hard as nails. Jo de Vries: They’re an unhappy people. I would rather be a Dutchman here than any German soldier. They want to believe that somebody is their friend. And that’s the trick. When we see some German soldiers up-close, they are the cheerfully unthreatening occupants of the rescue buoy that the airmen have commandeered. The use of a buoy was arrived at when P&P were puzzling how to furnish the crew with a believable escape route; they would surely be shot to pieces on the open sea. While there are some tense scenes during their escape, it’s also a remarkably smooth-running process that has the knock-on effect of suggesting this sort of thing isn’t all that hard (they hide from the Germans almost in plain sight, make short work of the few who threaten them, and then just need to have a good hard row to ensure rescue from the British Navy). While Powell’s tone may suggest the factual, you’re nevertheless conscious of how genteel and civil all the exchanges are (the closest to frostiness is from Brown, suspecting that the crew may be Germans, positioned to entrap the Dutch). Powell’s such a fine director that even a film made under the auspices of the war effort appears more insightful and balanced than much of the fare made during subsequent decades. The following year, P&P would hit a stride of greatness that would continue for nearly a decade, beginning with The Life and Death of Colonel Blimp. It was a film that would incur Churchill’s disapproval and would take as its central theme the friendship between a German and a British army officer over the course of three conflicts. Made at the height of the Second World War. Aircraft was the first film role for the positively skinny Peter Ustinov, who plays a priest. Also appearing is the strikingly featured Robert Hepmann as German collaborator. A ballet dancer, he would go on to star in both The Red Shoes and The Tales of Hoffman for Powell. But he’s probably most recognisable for causing many a youngster nightmares as the Child Catcher in Chitty Chitty Bang Bang.